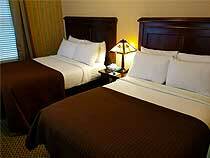 Friday/ Saturday guest rooms include breakfast for two. Weekday guests can upgrade their visit with an affordable Bootleg Breakfast. 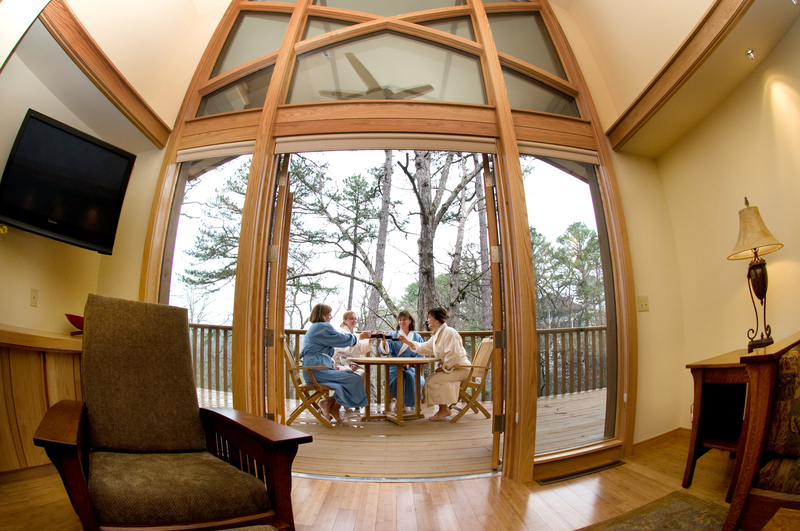 A daily activity pass (small fee) includes: parking, wi-fi access, hot tub privilege, walking tour, pool and resort activities at the Crescent Hotel and complimentary shuttle service to go between properties. In high Demand these are the finest suites with the highest amenities. 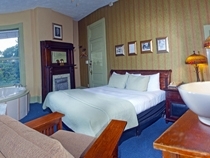 Suites include (Chicago Connection K/K) (Sunroom Suite) (Balcony Suite). 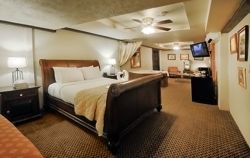 All suites feature king beds, seating area, and jacuzzi tub with balcony access in the Chicago Connection and Balcony Suite. 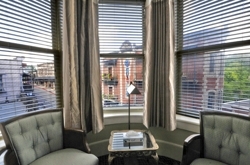 The Sunroom Suite has a one of a kind space that overlooks Spring Street. "Spa Collection" include upscale accommodations inside the spa. Rooms in the collection are furnished impeccabbly, include exclusive late-night access to the hot tub and deck, enjoy morning coffee or weekday continental, quiet hours at 10pm, no pets, robes and slippers, feather bed toppers, upgraded linens and a service assistant at the Spa desk. Call 877-643-4972 for availability. 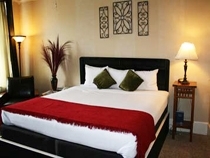 The 2-room Jacuzzi Suites include a queen bedroom, whirlpool tub for two and a separate living room. Suites offer fridge, microwave, coffee maker and sofa. 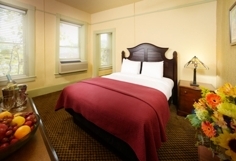 King Jacuzzi rooms have the best view of spring street and offer a cozy, comfortable space with wrap around windows and a jacuzzi tub overlooking the downtown area. Big rooms with excellent views. 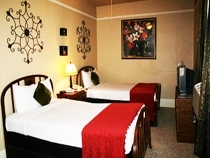 Superior Kings overlook the street and offer a king bed, sitting area, microwave, refrigerator and coffee maker. Great for families these rooms feature earth tone design with historic accents. Bet Value. With a view looking into the sun deck our D/D suites offer a seating room separated from the bedroom that offers two double beds and a bathroom made special with a corner jacuzzi tub.